Monday, October 9th is a make up day for Hurricane Irma. 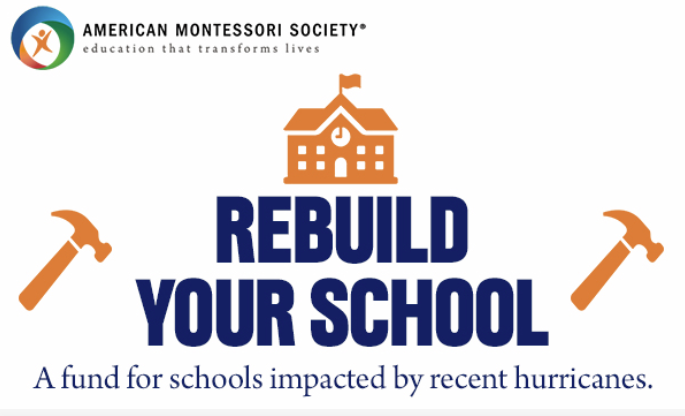 We will take this day to collect donations for the American Montessori Society's REBUILD YOUR SCHOOL FUND, to support the rebuilding of Montessori schools that have been damaged by recent hurricanes. 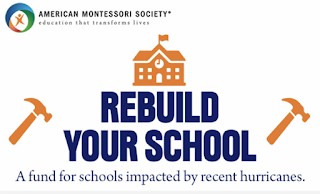 Please consider sending in a donation. And, for fun, we encourage children to decorate a hat as your favorite weather or weather related book AND wear to school! Think - "Cloudy with a Chance of Meatballs" or a hat of fall leaves. Thank you for your generosity and compassionate spirit!